When she graduated, she struggled for several months receiving rejections from job applications. Through the Job Centre, she discovered Making The Leap. At first she thought our programme was just another training provider, but she soon discovered it was incredibly tailored to each individual. Though some of the exercises were out of her comfort zone, she felt like she was in a safe and supportive environment, so she began to involve herself more, and her confidence grew. She really noticed her interpersonal skills developing, and could articulate her opinions better. She also made a huge improvement on her CV- thanks to spending time with one of our corporate volunteers, who explained how to structure them. 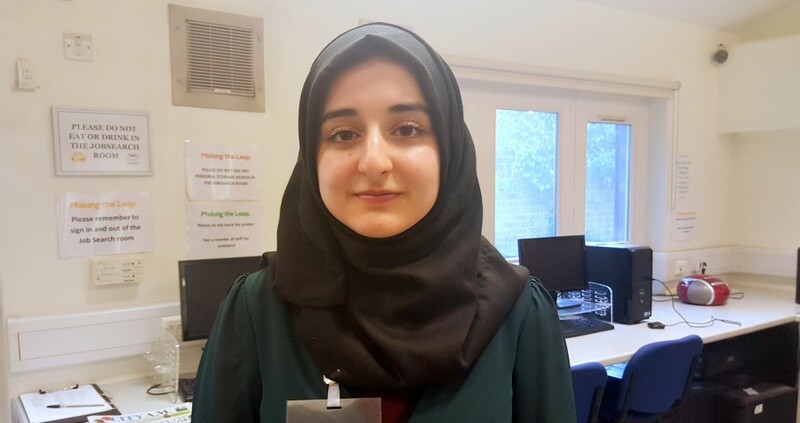 Adeeba wanted to find a career that would allow her to use her passion for Mathematics so we helped her apply for an opportunity within a top bank. Through the recruitment process, we supported her with psychometric tests, and telephone and face to face interviews. When she received the job offer, Adeeba could hardly contain herself – and told Making The Leap staff before anyone else! ‘It’s because of my background: growing up in this area, I couldn’t have envisioned these kind of careers without the help of Making The Leap. A mindset isn’t something you’re born into, it’s something you can work on. The staff here would tell me when I was doing well, and their praising me boosted my confidence a lot. Before you know these skills, they feel so out of reach, but Making The Leap takes it step by step which makes everything easy. The decider is how much effort you put in or how dedicated you are.